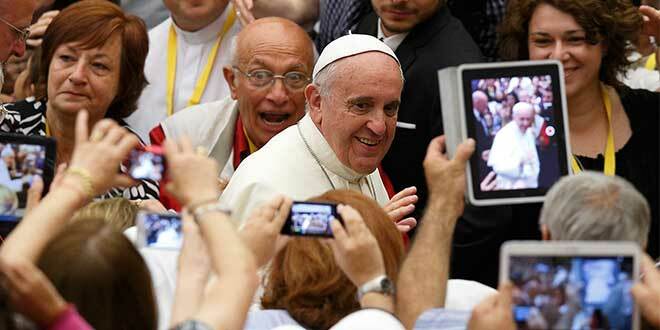 Home » Analysis » Are we listening to Pope Francis when he asks us to turn off our mobile phone at Mass? Are we listening to Pope Francis when he asks us to turn off our mobile phone at Mass? I ATTENDED a first communion recently and was bemused to see a dozen mobile phones and cameras held aloft and flashing, at critical times during the Mass. It’s not that I haven’t seen it before, or even joined the parish paparazzi myself. It’s just the disobedience thing. At the beginning of the Mass the children’s catechist specifically asked the congregation to switch off their phones for the duration of proceedings. And it came in the week that Pope Francis expressed his own displeasure at mobile devices – chiding the Catholic faithful for using them during Mass. The Pontiff said it made him sad when many phones were held up, and even priests and bishops were taking photos. Speaking at his weekly audience in St Peter’s Square, Pope Francis said that Mass was a time for prayer and not a show. “At a certain point the priest leading the ceremony says ‘lift up our hearts’. He doesn’t say ‘lift up our mobile phones to take photographs’ – it’s a very ugly thing,” he said. “Turn off your mobile” is a simple enough request, but for so many of us it appears the compulsion to stay connected, catch the moment and then post it is simply irresistible. Are we becoming so uncomfortable at simply witnessing some of life’s most cherished moments? Or does our desire to stay connected reflect some deeper fear of isolation? Earlier this year, Pope Francis offered some related, salient advice – families should put down their mobile phones at the dinner table and engage in conversation. He warned that a lack of dialogue between people and nations can lead to “war”. “When there’s no dialogue at home when we’re at the table and, instead of talking, everyone is on their phone … it’s the start of war, because there is no dialogue,” the Pontiff told students during a speech at a university in Rome. He made the remarks during a 45-minute address in which he chastised politicians for failing to listen to each other, saying a lack of dialogue could lead to misunderstandings and the outbreak of conflict. Ten years ago, even before smart phones allowed us to snap at will, priests in Brisbane were adopting a “no-camera” policy, banning families from taking photos during baptisms, because it was distracting. At a Gold Coast parish, Tanya Targett was shocked when the priest performing a baptism stormed out when she was taking photos. “This priest did the biggest dummy spit – we just couldn’t believe it,” Ms Targett, from Pittsworth on the Darling Downs, told The Courier-Mail. “He stormed down the back of the room, shook his head and said, ‘Well, I’ll just go outside and come back in when you’ve finished taking photos’. “I thought I was going to be kicked out. But the priest in question said: “At a baptism you’ve got a lot of un-churched people and we like it to be as special as possible. “If you spend all the time taking photos, you are missing the prayers and the families are getting distracted,” he said.